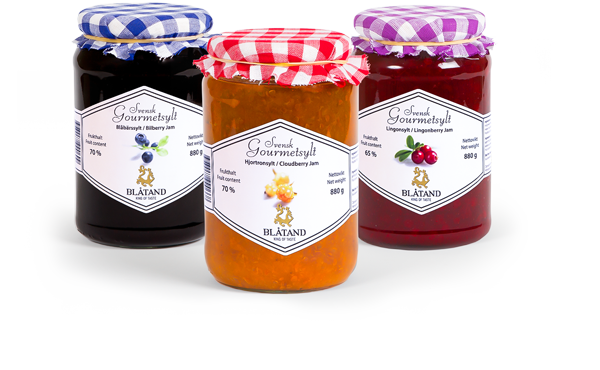 Adjacent to the Stöde berry-processing factory you will find the Blåtand on-site shop, which is open four days a week. Here you can buy both jam and frozen berries in large and small packs. We also offer a small range of game, fish and other delicacies. Open: Wednesday, thursday 2 pm to 6 pm. Friday, saturday 11 am to 2 pm. The on-site shop sells frozen processed berries (bilberries, lingonberries and cloudberries) in packs of 1.5 kg, 10 kg and 25 kg. Why not take the opportunity to stock up with a year’s supply? Our on-site shop is packed with tasty jam classics for the connoisseurs amongst you. Here you can buy gourmet jam made using traditional Swedish methods and with a berry content of up to 70%. Jams made from cloudberries, bilberries, lingonberries and wild raspberries are available in glass jars of different sizes: 120 g, 220 g, 410 g and 900 g. Treat yourself or that someone special in your life! We offer gift packs and products for individuals and companies looking to give that little bit extra. The door to the on-site shop is also open to those wanting to buy in bulk for their company, themselves or their family, a year’s supply perhaps. Blåtand lies 40 km west of Sundsvall in the beautiful Ljungan valley, alongside the E14. Our address is Stödevägen 80, 860 13 Stöde.